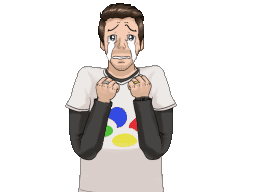 Anyone who has been playing video games for a large proportion of their life will accept there are games you know intimately, some you know of, and some you own but have never played. As I have talked aboutbefore, I grew up on a diet of Snes and Amiga games. While I definitely invested more time in the console, we certainly owned a lot more games on the Amiga. This was partly because of the ease of copying them and partly because they were so much cheaper. 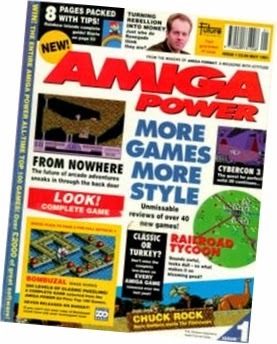 So cheap in fact that on occasions magazines would give away entire games on their cover discs, as was the case with the launch issue of Amiga Power. Proudly carrying ‘Bombuzal’ on their first ever cover, the magazine believed it was “a very good, very well thought out and very playable game, that never quite got the audience it deserved.” It was an opinion that publisher Kemco seemed to also share and so keen were they to bring this game to a Japanese console audience that ‘Bombuzal’ actually ended up being the third game released for Nintendo’s 16bit machine and the first to be published by a company other than the console maker. 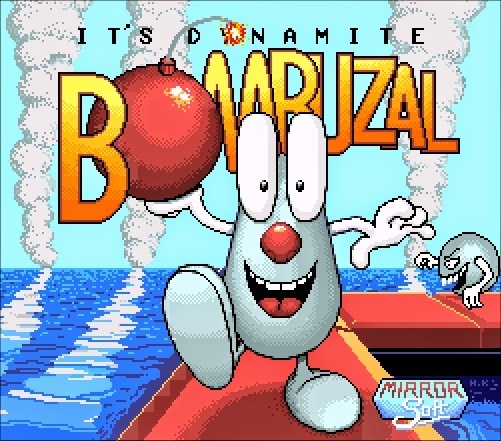 The problem was that being a four year old game originally released for a home computer, there was no way ‘Bombuzal’ was going wow new console owners in quite the same way that Nintendo’s launch titles had. Consequently, the game was largely over looked by most and when you play it now, some twenty years later, this was probably for the best. ‘Bombuzal’ is a puzzle game originally designed by Antony Crowther and David Bishop. 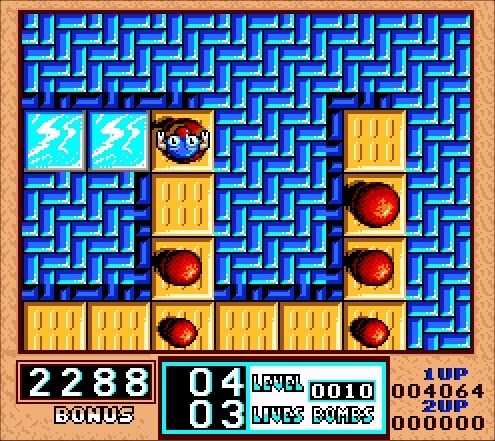 To complete each of its 130 levels the player must guide a nameless blue fellow over a series of tile boards and choose the best order to light the level's bombs. They never explode while you stand on them but you can only move one square from a bomb once you have chosen to activate it. As it explodes it removes the floor tile it stands on and any bombs in adjacent squares, triggering chain reactions. While the player can pick up and move any bombs on a rail tiles it is only possible to ignite the smallest kind without dying, as the larger ones have a bigger blast radius that can’t be escaped from. 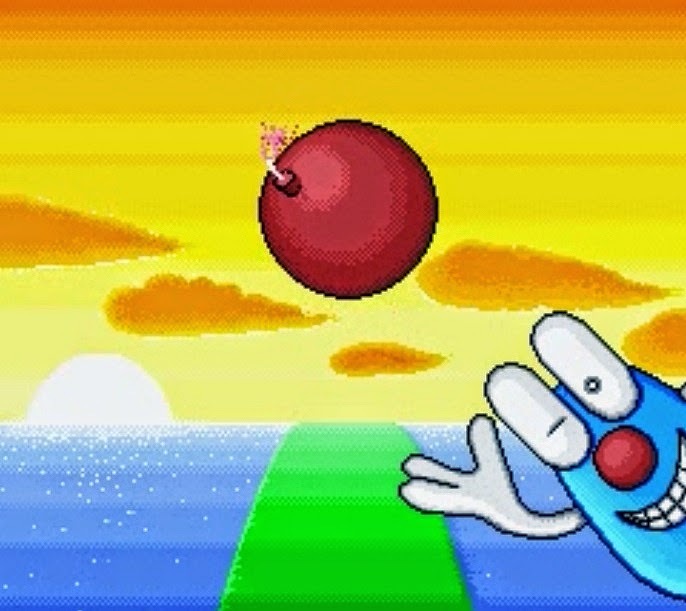 Consequently in most cases, the main focus of a level is deciding which small bomb to trigger in order to blow up all remaining larger bombs, while hoping the avatar is not killed in the resulting explosion. It starts off simple, but later levels confuse things when switches, enemies, slippery ice and weaker tiles are introduced. To play this game as apparently intended, you have to spend a frankly ludicrous amount of time thinking. Planning in advance how each bomb will interact with another and making a decision on the order in which to detonate them. The problem is you do not have a ludicrous amount of time to plan, as while you're wandering around testing switches or finding out if an ice tile leads off the edge of the level or not, there's a timer counting down. Without enough time to plan the level you have to impulsively choose which bomb you to detonate. With a counter there, each stage quickly becomes less about solving a puzzle a more a purely trial and error game. The complex stages may look like they have many different solutions, but for the majority there is only one possible way to solve each. Failure to stick rigidly to this correct path leads to having to restart the stage, as inevitably the player would end up trapped on one half of a stage unable to access the other. That is if they are not blown up in a blast they didn’t expect of course. One overall design choice actually makes this difficult game harder still – the choice of an isometric view. As with the majority of games viewed from this angle, character movement is at odds with the d pad. Pressing down actually moves you diagonally down-left and to avoid instant death caused by walking off the level you end up holding the controller at an awkward angle. The view even makes it hard to see the level you are meant to be solving. Bombs are obscured behind other bombs or the huge main spite and the angle makes it harder to calculate blast radius. Tony Crowther was one of the original designers and programmer of the game. 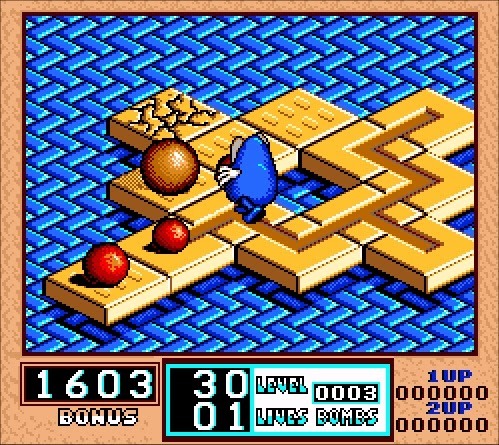 In an interview with Amiga Power at the time he admits he knew of these the problems caused by 3D style isometric view, but included it anyway. “Originally there wasn’t any 3D in it, we added the 3D later to make it look more attractive for magazines basically – we knew everyone would get much more excited about it then. 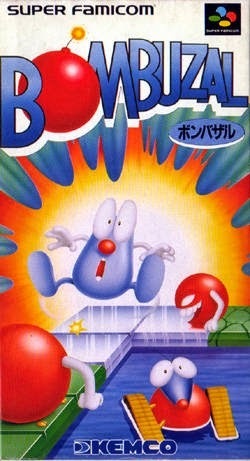 To be honest I find the 3D [View] a bit of a pain.” For a home computer game ‘Bombuzal’ may have been attractive enough to justify the compromises the visual have on the game play, but for a Super Famicom game its ugly. The main character is garish, and with a two frame walk is badly animated. His giant eyes may help you determine the direction he is facing, but with red pupils he actually looks bizarrely demonic and possessed. Fortunately pressing select and shifting the game to an overhead 2D map view means you don’t have to stare at this slightly repulsive avatar for long and this in theory gives you a better view of the stage layout. “I always play it in 2D” admits Crowther, “its nice and simple”. But here lies another problem; you can't scroll the map and its limited to the area around where your character currently stands. Consequently, you can't see enough of the stage to solve the puzzles, as it’s hard to plan how the chains of explosions will link together. It seems the only way to mentally map out the stage layout is to alternate between the two view points, but doing so takes up time which is rather limited anyway. In much the same way that graphics were changed to meet magazine reviewers expectations, in the translation from home computer to Super Nintendo, the music was changed to meet the new audiences expectations. Horrendous level music was added to the console version, which is limited to one track across all 130 levels. At a few minutes in length it repeats far too frequently but even so it wont be the thing you hear most frequently. 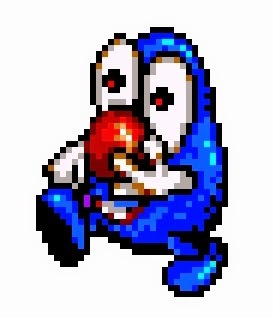 In the original Amiga version of the game digitized speech was added to signal the start of each stage, something that is carried over to the Super Famicom version. It sounds impressive the first time, but for a game that ends up being trial and error hearing it every time you restart a level becomes very annoying very quickly. So bad is the sound in fact, that I actually thought what was a mistake actually was an intended audio flourish. Around a minute into playing a level theme the stage announcer started endlessly repeating “get ready” over and over again, not in time with the music and the sample kept on getting cut off. However when the next stage had the same audio ‘glitch’ at the same point in the music I realised it was another bizarre design choice. It seems like the designers felt that playing an (admittedly quite nice) vocal sample, every time you restarted a level wasn’t enough. Evidently so proud were they of their sample that they decided it appropriate to force the player to hear it even when it was out of context. The terrible music was apparently reworked in the American version. 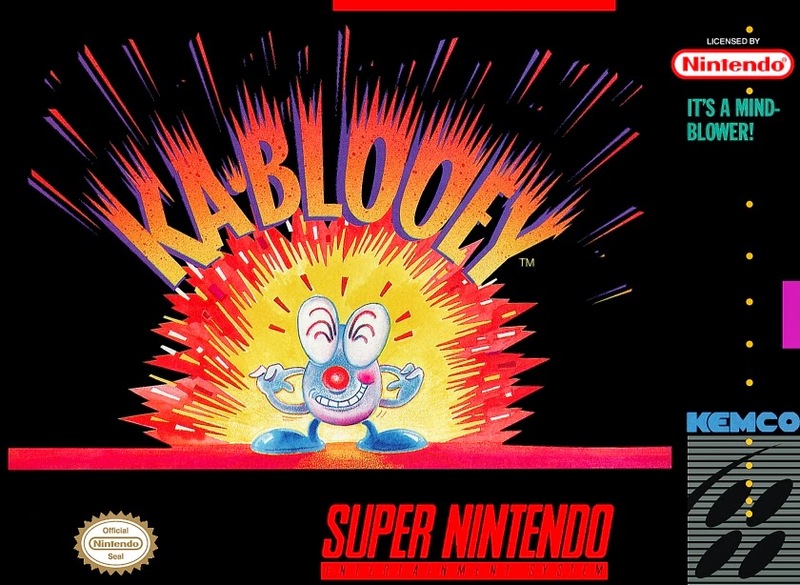 Released in August 1992 as ‘Ka-Blooey’, this version’s punchier music and sound effects were intended to make better use of the Super Nintendo sound hardware. In exchange for this someone thought it would be a good idea to remove the 2D overhead playing view. It seems odd that Kemco would return to their first ever Super Famicom game 2 years after the initial release, especially as it had done so badly commercially. Even more bizarre is their decision to remove the only way of playing that doesn’t require you to tilt your controller and the only way of being able to see how the level is truly laid out. Without it, trial and error really is your only option. 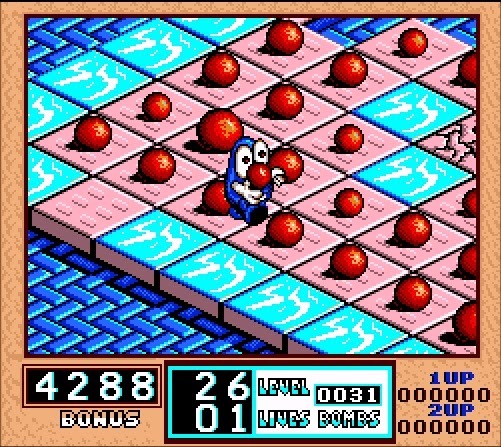 Ross Goodly, programmer of the Amiga version, is of the mistaken belief that “as a puzzle game it’s at least as good as ‘Tetris’”. He is wrong of course as that fantastic game is enjoyable beyond level 30. Thinking and forethought in ‘Tetris’ always leads to a great chance of success, in ‘Bombuzal’ completing a stage depends on a large dose of blind luck. The central premise of ‘Bombuzal’ is good, but its execution is so terrible that the game can’t be considered anything other than awful. Perhaps this is why Amiga Power gave it away free all those years ago. Anyone paying even a few pennies for it would have felt short changed. A few months ago a very generous French reader contacted me saying he wished to send me some of his duplicate Super Famicom games for free. “I know you like the strange Japanese games” he wrote, “so you[‘ll] be pleased with these”. While some of the games he sent are actually great, sadly ‘Bombuzal’ is not. Though it brought back memories of playing my Amiga as a child, I think I realised then as I do now that it doesn’t deserve much of my time.People in PAL territories are lucky; the game wasn’t released here. To everyone else I’d suggest you give it a miss and play instead a puzzle game that taxes your brain rather than your patience.